Please read these terms and conditions of use as the use of this website signifies your agreement to the user it. In the event that such conditions are not accepted, please do not use in any manner the site. Apemaglia assumes no responsibility for the use and interpretation of information contained on its website. Apemaglia OFFERS ACCESS TO THE SITE ON AN "AS IS" (IN THE STATE) AND "AS AVAILABLE" (what is available). THE USE OF THE SITE IS AT YOUR OWN RISK WITHOUT WARRANTY OF ANY KIND, EXPRESS OR IMPLIED. This website has been compiled with the utmost care and attention. Despite the fact that the information provided is correct, the same may contain errors or inaccuracies. Please note that the download and / or 'obtaining any material through the use of the website is done at your own discretion and risk and you will be regarded as solely responsible for the damage caused to your computer or data loss as a result of downloading of such material. 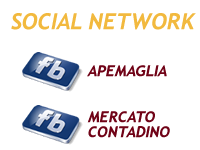 This website contains hyperlinks (links) to other sites developed by people over whom Apemaglia has no control and is not in any way responsible for the contents, accuracy, and at the services and content offered. These sites could also send cookies to users, collect data or require the sending of personal information. The visit of these websites is done so only under your responsibility. 3) make sure that the link does not state or imply that Apemaglia sponsors or supports the activities of any other site, company or entity. Apemaglia collects and uses personal data of its users according to the D. Decree Law 196 dated 30/6/2003. This decree is intended to ensure that the processing of data is conducted with full respect for human rights, fundamental freedoms and dignity of persons. Pursuant to and the effects of. 13 of that decree, inform the user that the data provided to us by email or proper form will be treated in compliance with the above and the obligations of confidentiality, legality and transparency and protecting their rights. 4) Finally, it is recalled that Article. 7 D. Legislative Decree 196/2003 grants the exercise of certain rights, including those to obtain the updating, rectification, integration as well as the deletion of your data, making explicit request.